He was on all fours, underneath a desk, with a thoughtful though slightly panicked and perspiratory-ish expression on his glowing face. He had a purpose, but he was running out of time. He turned his head leftward as far as he could out of the corner of the utmost bounds of his beaming left eye to see if his boss was approaching, beads of sweat forming on his translucent forehead. Just a few inches above his flattened back was the desk that was like no desk in this world, and just a few inches below the desk was where he was sprawled plank-like on all fours, propped up by two elbows so his hands and fingers were free to hold with one hand a cylinder shaped contraption wrapped in protruding inch-long, old typewriter-looking keys, with a box resembling the old Texas Instrument’s Speak ‘n Spell from the early ’80s dangling on the floor from the bottom of the cylinder, attached by a two inch long cable as thick as a garden hose. The unusual apparatus was connected by a root-ball patch of brightly colored wires spliced into a large network of glowing cables on the other side of the uneven cut-out hole of three-inch thick drywall just behind the darkest corner underneath the other-worldly desk. The pattern was for this man to type a few keys with every free finger and then check behind him to make sure he was still alone, repeated many, many times, until, unbeknownst to the man, he was suddenly discovered by the desk’s owner, a very important person. At about the same time, the man heard a familiar heavenly sound while underneath the desk, so he stopped typing immediately. He was calm and his message was nearly finished, but not completely. “They’ll know what I wanted to tell them,” he thought as he backed out from underneath the desk. Soon, the man stood eye-to-eye with his Superior. No words were exchanged. The guilty man was never heard from again in those parts. What was he doing under that desk, you ask? You see, he was hacking from his world into our world. He world hacked from his world’s Whole-World Wisdom network. As the name suggests, the W-WW network was infinitely more wise than our own world’s mostly junk-filled World Wide Web, and somehow, of all the millions and millions and millions of available hacking destinations for an accomplished hacker from another world, this man hacked from the obscure corner of his world into an obscure website at the farthest outreaches of our world’s World Wide Web of interwoven websites. Having accomplished his task of breaking into our world’s internet, he very randomly chose to hack the website joshrolph.com, or my own, not because he was looking for it but because it seemed like the weakest link of the entire internet. Hi, I’m Bob, and I’m dead. I’m a dead Bob. 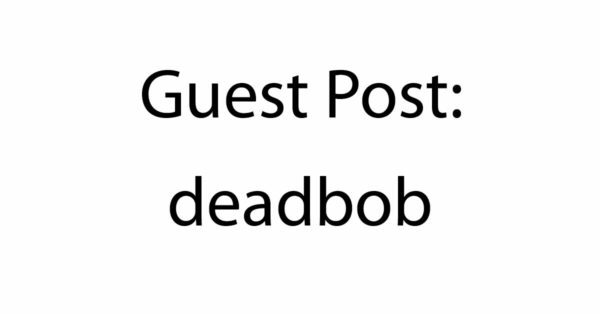 People over here actually call me “Deadbob,” all one word. Everyone in my death support group thinks Deadbob sounds hilariously funny. Sure, it’s funny. But it’s not hilariously funny. And it’s nowhere close to being twenty-two years of hilarious funny, like they think it is. This is more than likely strange for you to be reading a message from a dead guy who is writing this while dead. You probably feel uncomfortable. Don’t feel uncomfortable. You probably don’t believe I’m really dead. I ask you to trust me. You may feel a little sick to your stomach. Just take a few deep breaths and keep reading. Where you are, I once was. Where I am, you will be. This won’t take long because I don’t have much time. The Boss is away from his desk and when he finds me, it’s all over, so to speak. Let me first clarify that my death support group mentioned above, the one that calls me “Deadbob,” has nothing to do with death support, which isn’t a thing. Death support isn’t like life support, either. Life support tries keeping you alive. Death support doesn’t try keeping you dead. There is no trying to stay dead. You’re just dead. That’s it. My death support group is more like a focus group. It’s sort of like a focus group of friends-in-death sitting around, talking about death’s purpose and meaning while participating in some intense high-stakes poker. Our philosophical system we in the death support group spend so much time discussing is what we call nonexistentialism, which kind of makes sense, right? There are some who call themselves the existentialists – mostly the dead French, ever the contrarions – but we keep reminding them existentialism deals exclusively with existing in life. Huge difference between life existence and death non-existence, we remind them, but they’re stubborn ’til the end, as it were. In short, I don’t think the deadbob moniker sounds funny at all. Dead people, and you, should just call me Bob, since that’s my name. I don’t need a nickname in death. Believe me, over here, a nickname can get really old, really fast, sticking for hundreds of years. Nicknames are like a second death sentence. That said, I haven’t been over here for hundreds of years. Any guesses on how long I’ve been dead? I gave a clue earlier. My twenty-second deathday is coming up. I was deathed in April, 1995. That may seem like a lot of death experience to you alive people, but it’s nothing compared to the incredibly loud Cro-Magnon family down the street. When I first died, there was never an initiation and no one ever picked on me for being a newbie. I’ve never been hazed, for example, by experienced dead people, like the tribe of ancient Sumerians catty-corner to my place. But instead of focusing on my eclectic neighborhood, let’s get back to death. Invariably, that’s the first question I get. Of course, any student of history knows there was no nuclear holocaust in 1995. I say that to test whether they’re up on their current events. But that’s far from the point I need to make in my limited time communicating with you. The reason I’m writing at this very moment is because when I was alive I used to wonder on rare occasion what it was like after death. Would I keep on living or cease to be? If I was still around, would I have form or would I become memory or ether or some element the Alives haven’t yet discovered or couldn’t comprehend with their finite minds? I don’t wonder anymore, mostly because I’m dead, and the dead don’t wonder much at all. When you’re alive, you’re always thinking and wondering and making decisions. The dead simply don’t have need to wonder. At more contemplative moments you Alives might think, “What’s it all for?” or “What’s my purpose?” Those questions don’t directly involve death. At least, you’re not thinking about death when you ask them. But in reality, those questions and all of life in your world revolves almost exclusively around what you don’t know, which all revolves directly on the mystery of death. You’re living for something that you can’t explain. It’s some abstraction you can never put your finger on. Why? Because you don’t want to face the certainty of the mystery of death. You’re living in this continual anxiety-laced panic. Why? It’s almost entirely because of the mystery of death. You’re trying to fit it all in. Why are you doing that? Calm down. You’re gonna die. I don’t want to upset you. It all makes sense now. It didn’t when I was alive. I ignored death. I pushed it aside. I was a death denier. Sure, other people died, but not me. I was alive. And then, just like that, you die. And there’s really nothing more to have anxiety about or to be panicked about or even to live or die for, because you’re dead. You can’t die again so there’s no dying for anything. You’re not alive so there’s nothing to live for. It’s actually amazingly wonderful, the capstone of wonder or the fulfillment of wonder, which is why we in death don’t wonder. We indirectly wondered about the mystery of death all our lives. Now we have no need. And the only way to find death wonder-fulfilled is by first living. That’s what it’s like to never die again. It’s wonderful. And notice I didn’t say “That’s what it’s like to live forever.” I would never say “That’s what it’s like to die forever” because you can’t “die” forever. On this side, we stop using the word forever. I said “forever” all the time when I was alive. I never say it here. No need; never. Over on this side, there’s nothing that could destroy me to make me dead again or more dead than I already am. I could swallow a nuclear bomb full of heroin-soaked syringes and anthrax-baked nails and electric eels wrapped around my chest and limbs while I’m sitting on the electric chair, and such, but not even that elaborate death-inducing death agent could make me more dead than I happen to be at this very moment. I’d still be just as dead as I already am. It’s really quite great. All I’m remembering is Speak and Spell. I think Dead-Bob is actually from a ‘parallel universe’ or one of the many theorized ‘quantum or alternate realities,’ and he only THINKS in his ‘dead-zone’ that he was killed on our Earth by a nuclear holocaust, which happened in HIS ‘time-line,’ and ‘alternate reality,’ but not in ours. I think Dead-Bob would be surprised to know that in OTHER ‘parallel universes’ he is still alive, or, that he really did get hit multiple times by a bus as you imply at the end of your blog. In fact, YOU Josh are possibly in an ‘alternate reality’ even as you wrote and conceived the piece, and I’m your Father in THIS time-frame as well as in all the others, but YOU were actually hit by a bus or during a nuclear holocaust, and your subconscious has suppressed that fact and it is manifesting itself ‘through your blog account,’ wherein you only THINK you wrote it, but ‘Jumpin-Jack Josh’ actually wrote it, when he was standing at a bus stop, texting when a bus….